Hosts Russia are set to open their campaign of FIFA Confederations Cup 2017 with the opening game against New Zealand on Saturday, 17th June 2017 at the Saint Petersburg Stadium in Russia. Portugal and Mexico are the other two teams in the group A who play their game on Sunday. Russia must win this game to put themselves in a position of getting out of this group as one of the top two where European champions Portugal are favourites to top of the group. The game is suppose to kickoff at around 16:00 uk time and BBC will have live coverage in the UK. Live & Highlights: If you missed the live action, you can always tune in here for match highlights which will be posted immediately after the game is over. Russia has only this competition as competitive action before next year’s 2018 FIFA World Cup and head coach Stanislav Cherchesov is set to use full strength side looking for impressive performances. Number of young players are included in the squad and Cherchesov will go with a balance of youth and experience hoping to get a better idea of his first choice XI 1 year ahead of the big competition. Russia hold of Chile in their last warm-up game going into the Confederations Cup and that will give them enough confidence to get a positive result which everyone is predicting against New Zealand. 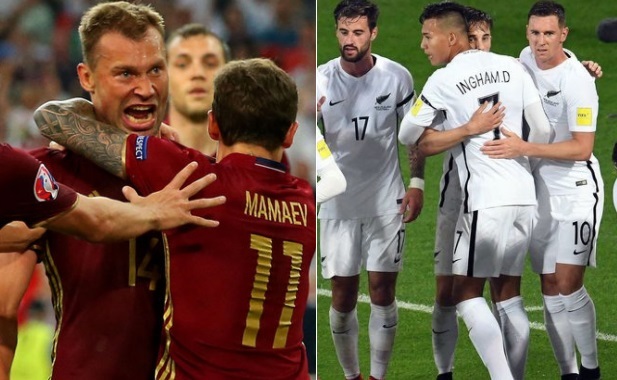 Russia did not had the best European Championships in 2016 where they only managed to grab 1 point of three group games before crashing out of the tournament. Since than they have been playing friendly games because as hosts they have already qualified for the World Cup and this tournament is key to their preparations for the big event next year. New Zealand on the other hand enter in the competition after winning Oceania Cup which is also regarded as the weakest regional international competition specially since Aussies moved to Asian competitions. Going into the game All Blacks are pretty much under dogs and anything but a defeat will be a good result for this team. Sorry to say New Zealand football team called “all whites” not the all blacks ! All blacks qre the national Rugby team!